Today, working from home is not unusual or as tricky as it was some time ago. Thanks to the internet and portable computers, you can now work anywhere in the world and earn good money. Technology has affected organizations’ structures. Where a company previously had full-time staff, they can now choose to outsource work to freelance specialists instead. It wasn’t so long ago that transcribers commuted to work. Nowadays, transcription work is one of the most outsourced jobs over the internet. You can now work from home as a full-time transcriptionist if you have a fast internet connection, a computer, and competitive typing speed. Like any other job, it requires hard work, passion, and patience. You may also discover you’re doing better in one topic than another, which is one way to help you choose what to specialize in if you wish to. Read on to find out how you can stand out from the crowd and become a successful transcriber without stepping out of your home. However, there’s more to being a successful transcriber than just typing speed and a fast internet connection. Be prepared to work extra hard to strike a good work-life balance. When in the office, it’s easy to put in the work because you’re expected to. As a freelancer in the confines of your home, you manage your own time and work. You’ll need the discipline to get started and the persistence to keep going. Set the pace by transcribing your favourite videos or songs. Daily practice will give you enough preparation to pass transcription tests. Set the number of hours you need to transcribe in any one day and stick to it. Remember, working from home gives you many benefits, but you need to put in the hard work to produce the quality expected from your clients. Patience: The most challenging work will be the best training ground for you. Audio with low quality and heavy accents still require clean and accurate transcriptions. In transcribing, you will need to slow down and look up words for context. Time-coding transcription also takes time, and you need to be accurate. 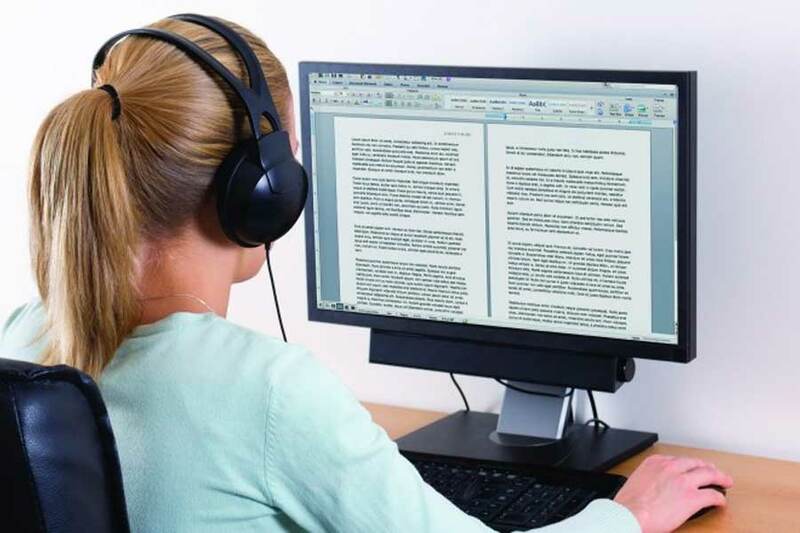 Error-Free Documents: The best quality you can have as an audio to text transcriber is not your typing speed but your ability to focus on quality. Your documents must be 100% accurate regarding content and grammar. Over time, your typing speed will increase. Go with Demand: Do not make the mistake of coughing-up a lot of money for a transcription course that may not get you any work. At the moment, general and legal transcription is on the rise; medical transcription less so. You get to transcribe all kinds of audio or video files such as speeches, podcasts, films, interviews, court proceedings and many more. Under general transcription, there are popular niches such as legal transcription, data entry, offline captioning and financial transcription. To succeed in medical transcription, you need at least one year of training to become familiar with medical terms. This type of transcription is for the most advanced typists and keen listeners. Just like medical transcription, it requires training. Unfortunately, for court proceedings, you have to physically be in the court, however, for real-time captioning, you can still work from home. Keen Listener: Being a keen listener will help in creating quality content that matches audio files. Patience: Sometimes accents are heavy, or the audio quality is low. Rewind, listen, rewind, listen, rewind, listen, until you get it right. Research skills: You have to learn to research words and their meaning and context so that you understand what the speaker is saying.